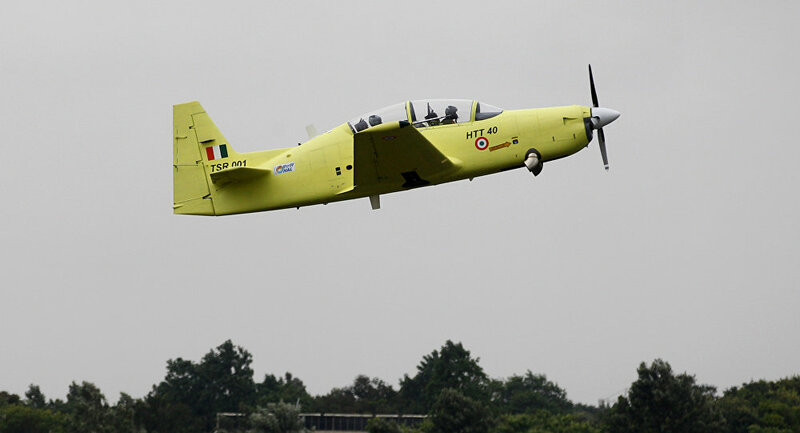 India's home-grown HTT 40 (basic trainer aircraft) has successfully completed the two-turn spin test, which, according to the manufacturer Hindustan Aeronautics Limited (HAL), has heightened hopes for final production clearance by year-end. "The successful start of the spin testing gives a boost to HAL and also restores the credibility of HAL in successfully designing a spin worthy aircraft," R Madhavan, CMD, HAL said in a statement. Spin testing is the most crucial and challenging aspect of flight testing of any aircraft development programme. HAL's Aircraft Research and Design Centre (ARDC) had conducted extensive wind tunnel testing and mathematical model analyses to arrive at the spin characteristics of the aircraft. HTT-40 would be used for basic flight training, aerobatics, instrument flying and close-formation flights whereas its secondary roles would include navigation and night flying. The project started its detail design in August 2013 with internal funding and quickly made its way to the spin tests in just a matter of five years. Indian Air Force (IAF) has a requirement of 183 basic trainer aircraft. The Defense Ministry has already approved procurement of 70 Basic Trainer aircraft from HAL.